The Wrap: What the Dickens does Australian rugby do now? And so begins Charles Dickens’ classic 1859 novel, A Tale of Two Cities, an epic tale set in the looming shadow of the French Revolution and the storming of the Bastille in 1789. As an abject 7-31 deficit at half-time against Argentina in Salta was transformed into a comfortable, going away, 45-34 victory, it is as if Dickens’ words were written specifically for the Wallabies – and, it must be said, the Pumas as well, whose split personality was starkly laid bare in the face of Australia’s grand second-half comeback. This truly was the game of two halves. It’s been a tough winter for Australian rugby. Yet another one, weary fans might despair. Grumblings from the fan-base and sections of the media towards Rugby Australia continue unabated, the home Test series against Ireland was lost, the Bledisloe Cup remains off-limits, and while on-field performances of Australia’s now four Super Rugby sides improved, this was insufficient to deliver any of them a realistic shot at the title. To cap things off, last week, rugby’s reputation was damaged even further, with Nick ‘Honey Badger’ Cummins’ raising the ire of TV watchers and, in the process, catapulting Australian rugby back into the mainstream headlines for all the wrong reasons. For those not up to speed, Cummins has been ‘flat out like a lizard drinking’ capturing and breaking hearts as the ‘Bachelor’, although ‘disappearing like a rat up a drainpipe’ when things got to the final commitment phase appears to have gone down as badly with Australia’s romantics as your average Ned Hanigan clean out. But with the Badge doing a runner to join a mate on a fundraising walk of Papua New Guinea’s Kokoda Track – well out of Twitter range – any thoughts that the Wallabies’ performance in Salta might sneak under the radar were squashed. Social media has exploded with angry demands for an explanation from Cummins, as soon as he returns. Which is pretty much the same situation Wallabies coach Michael Cheika finds himself in. Wallabies fans today will be struggling to comprehend the merits of this victory. Let’s be clear, a 38-3 second-half against a capable, confident Pumas, away, at altitude, is a heck of a performance. There were some wonderful tries constructed, and the win lifted Australia off the bottom of the Rugby Championship ladder. But neither can the sorry first-half performance be shut from the mind’s eye. Credit to the organisation and free-stepping of the Pumas of course, but it is the Wallabies’ defensive failings, lateral backline attack and lack of individual composure leading to miracle balls being fired willy-nilly to targets not in position to catch them that ring loudest. 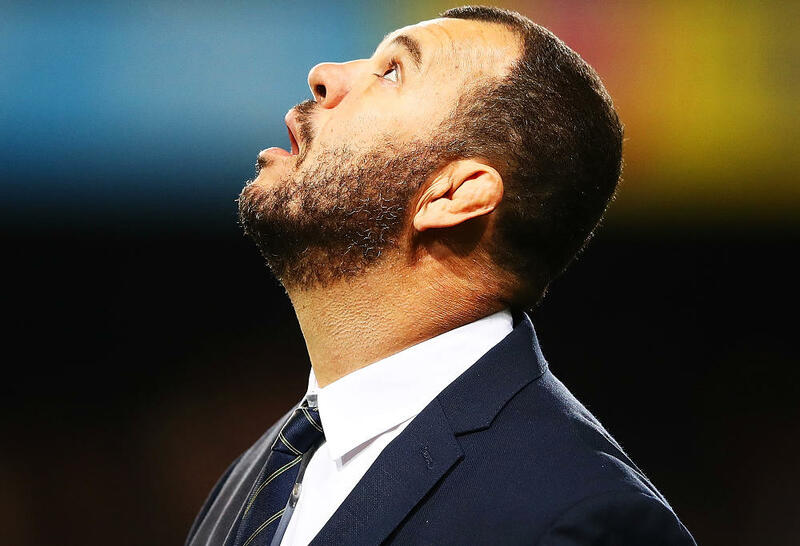 Ironically, it is the starkness of the turnaround – the collective team response to Cheika’s ‘backs to the wall’ call to arms at half-time – that will make an impending review at Rugby Australia headquarters all the more difficult, because it is these ‘triumph out of adversity’ situations that Cheika values the most. He will point to a united dressing room prepared to dig deep and find “true meaning” in the game to save his – and in many cases, their own – arse. But, despite the heroic manner of the win, it would be fools gold to regard this as a watershed moment; one where Cheika re-asserts his authority over the program and convinces his bosses, and the fan-base, that the Wallabies are on track to World Cup glory. For one, the Pumas contributed greatly to their own demise. Almost certainly they are overly reliant on Nicolas Sanchez and, once he left the field before half-time, nobody stepped forward to fill the vacuum in leadership and direction. 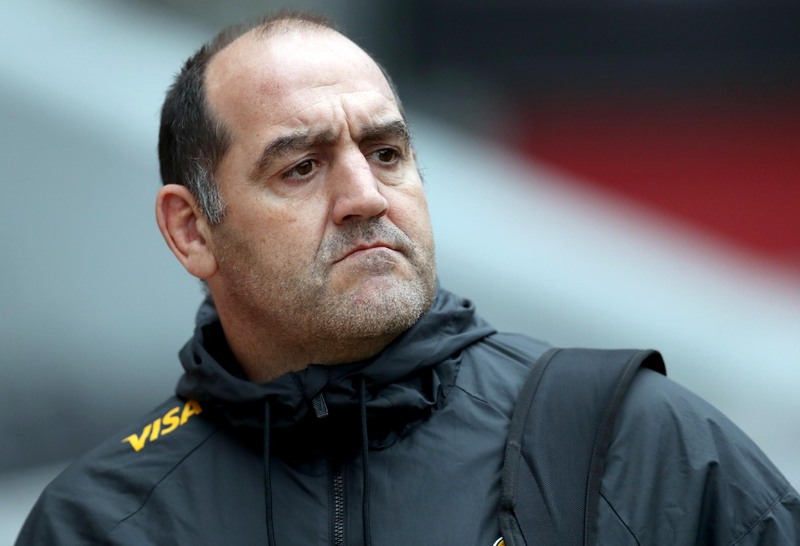 The Pumas are a greatly improved side under Mario Ledesma but, unsurprisingly for a team that has tasted little success in the Rugby Championship, they are still learning how to win. As for the Wallabies, there remains widespread belief that they are no better now than at any other time in Cheika’s tenure. As much as he might be prepared to argue otherwise, this demands not only acknowledgment from those in charge of the game in Australia, but change of some description. It matters no longer that Hanigan would not have earned his 17 Test caps at any other tier one nation, or whether Quade Cooper, Bernard Foley, Kurtley Beale, Reece Hodge or Matt Toomua would best serve the Wallabies at 10, or Joe Powell and Jake Gordon have been denied opportunities to build depth at 9. It also matters no longer that Cheika has at times bought shame and ridicule upon himself and the Wallabies jersey through childish and petulant behaviour on the sidelines. And yes, it is true that Cheika has not been dealt a strong hand in terms of Australia’s weak elite player development funnel. What matters now is the future – what happens from here. There will be a review meeting, most certainly, and the discussion between Cheika, and Rugby Australia’s CEO Raelene Castle and its high-performance heads will no doubt be frank and detailed. But because Cheika is, and always has been, his own man, exactly where things head from there is anyone’s guess. The fact that the team is united behind him carries weight. Coaching tenures have a natural life-cycle that often coincides with the players tuning out, but unlike Ewen McKenzie and Robbie Deans before him, the players have not stopped listening. Thus if Cheika is open to change of some description – with Stephen Larkham and Nathan Grey under most pressure – he will keep his job, at least for now. However, with four assistant coaches already on board – none of whom, because of the manner in which Cheika runs his operation, are fully accountable – there seems little sense in adding another voice to the mix, unless there is a structural and/or personnel change attached to it. Finishing runner-up in a World Cup buys a lot of credits, but with an underwhelming 2017 and three-win, six-loss record this year, Cheika’s have long since expired. It can no longer be ‘my way or the highway’, or ‘trust me, we’re on the right track, just watch us fire in the UK next month’. There has been criticism of the administration seen to be ‘sitting on their heels’ over the matter, but whatever Rugby Australia owes the people involved, and the fans, it is not the airing of dirty laundry and the playing of this matter out in public. 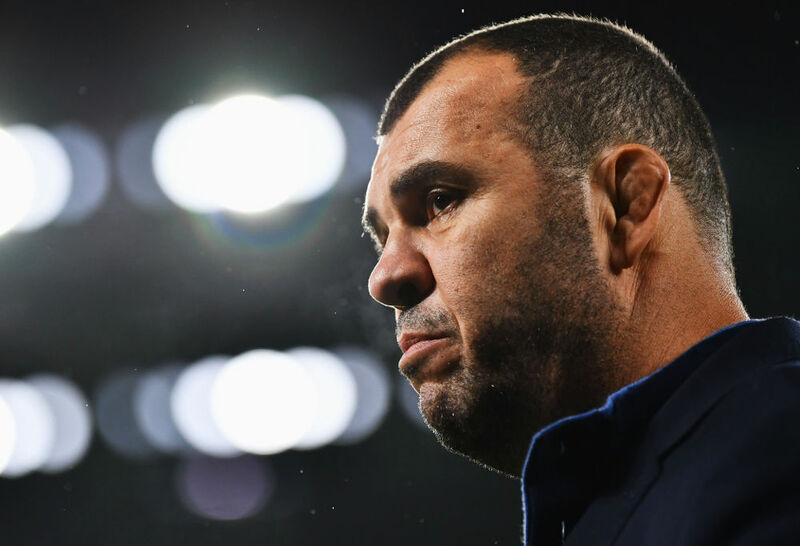 Rest assured, there will be pressure will be placed on Cheika to agree to change his approach – coaching and playing personnel, tactics or both. If he does, then changes will be made almost immediately. If not, then the possibility of a change of head coach looms larger. To their credit, Rugby Australia seems fully focused on achieving the best rugby outcome – regardless of the fact that replacing Cheika and his assistants, and compensating the owner of the contract of his replacement, would represent a hurtful transactional cost in the vicinity of $1m. As to who that replacement might be? Look for a change not only in personnel, but in the type of set-up, where the role of ‘head coach’, such as in Cheika’s case, will be superceded in favour of a ‘director of rugby’ position, with greater coaching emphasis and responsibility, and selection input, shifted down to an elite team of specialist coaches. This model is not at all far removed from that of Rod Macqueen’s World Cup-winning set-up in 1999, where McQueen was smart enough to play to his strengths – indeed he famously indicated that the thing he most had going for him was the fact that he wasn’t an accomplished, technical rugby coach. In a similar vein, Sir Clive Woodward won the 2003 World Cup using a like model – his 2004 book Winning is not an account of his rugby smarts, but of his superior organisational skills, managing the myriad, complex tasks and weight of expectation associated with any successful, major professional sporting organisation. The man who best fits this mould ticks a couple of important boxes. Scott Johnson is Australian, and he has already made impressive headway in a similar role – helping rocket a greatly improved Scotland past Australia in the world rankings. In terms of pure coaching, this would open the door for other Australian coaches overseas, like Matt Taylor and Scott Wisemental, and also the possibility of closer interaction with one or all of Australia’s developing Super Rugby coaches. In the meantime, the timing of any such transition is down to Cheika. If he accepts the need for change, and the upcoming northern hemisphere tour is a success, then he will get his shot at a World Cup, and an orderly transition will occur at the completion of his contract. However, if it is not the second-half side from yesterday, but the first-half side that tours, then all bets will be off. My favourite Dickens work is Bleak House, with the 2005 BBC adaptation starring Gillian Anderson, Charles Dance and the superb Phil Davis an absolute feast for the eyes and ears. Should things continue on as they are, it would be uncanny to think that an English author, from 160 years ago, could so accurately have his finger on the Wallabies’ pulse. With stunning comebacks the order of the weekend, the All Blacks did their bit, turning a 13-30 deficit into a remarkable 32-30 victory against the Springboks, in Pretoria. Since Steve Hansen became the New Zealand coach in 2012, there have been a number of great escapes and comebacks by his team, but in those situations – Dublin and Johannesburg spring readily to mind – there was always a sense that the All Blacks, despite being behind on the scoreboard, were playing well enough to pull a win out of the fire. Not so here, the 30-13 scoreline accurately reflecting the difference between the sides, and even with the margin reduced to ten points with seven minutes to play, a second successive Springbok win seemed both deserving and assured. The All Blacks lacked presence throughout – partly due to an ill-disciplined start that saw five penalties given up in short succession, and a shallow kicking game that gifted the Boks territorial dominance. As a result, they were never able to build phases and exert pressure back on their opponent. The final two match-winning tries to Scott Barrett and (the once again excellent) Ardie Savea were the antithesis of this. It was as if a ‘lightbulb moment’ had finally occurred, helped by the injection of TJ Perenara and Richie Mo’unga who, watching from the sideline, could see that a more direct approach was required. Surely this display of clinical forward finishing power will serve as a lesson too for halfback Aaron Smith who, when driving a similar attack in the first half – the All Blacks’ sole raid for the stanza – wasted the opportunity by trying to milk a penalty. As it happened, 6-6 at half-time represented a win for the All Blacks on the run of play, and will give Springbok coach Rassie Erasmus cause for concern. A field-position strategy is one thing, but too many times the ball was kicked away on attack. While this helped pin the All Blacks in their defensive half, it did not hurt them on the scoreboard. There were grumblings too about the effectiveness of Erasmus’ bench, and while the All Blacks obviously finished the stronger, they did so too in Wellington where, that time, the Boks held on for the win. What is less arguable – and what will delight fans of both sides – is that the traditional, heavyweight rivalry is once again at the forefront of international rugby. Springbok captain Siya Kolisi has grown in stature throughout this tournament – as a player and a leader – and is thus a key figure in this transformational phase for South Africa. The quirk of the World Cup draw sees New Zealand and South Africa facing off on Saturday, September 21 in Tokyo – day two of the tournament. Given these two recent epic encounters, this already looms as the pivotal moment to ignite the 2019 World Cup.